The Olympic athletics started today! As if I am not watching enough TV at the moment, ironic really! Bloody exhausting though! It will be a safe bet to say you will see a lot of the Kenyan flag. 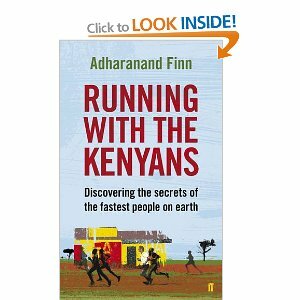 After years of watching Kenyan athletes win the world's biggest races, from the Olympics to big city marathons, Runner's World contributor Adharanand Finn set out to discover just what it was that made them so fast - and to see if he could keep up. Packing up his family (and his running shoes), he moved from Devon to the small town of Iten, in Kenya, home to hundreds of the country's best athletes. Once there he laced up his shoes and ventured out onto the dirt tracks, running side by side with Olympic champions, young hopefuls and barefoot schoolchildren. He ate their food, slept in their training camps, interviewed their coaches, and his children went to their schools. And at the end of it all, there was his dream, to join the best of the Kenyan athletes in his first marathon, an epic race through lion country across the Kenyan plains. With global attention on both the London Marathon in April 2012 and the London Olympics in the summer, there has never been a more exciting time to experience what it is really like to train and race with the stars of distance running. Kenyan runners are beautiful to watch, even as I struggled on the Lewa run, I cheered on the Gladys Otero who passed me to be the first female in for the full marathon in 2 hours 48 min. Although Finn is a very good runner, he too is always in awe of these Kenyan runners, who continue to break records and make it look so easy. Although Finn starts his research and his time in Kenya researching the barefoot strategy, to find out if that is the reasons why Kenyans are such good runners, it is quite obvious from early on that it is a number of factors, not one, that make Kenyans so fast: The drive and hunger to do well, the simple fat-free diet, the altitude, the understanding of 'rest' in the day, the hard-working lifestyle from a young age etc. I saw a young muzungu (foreigner) wear a pair of 'barefoot' running shoes in Lewa and I cringed. I wondered if she knew how the terrain changed from sand to rocks and wondered if her feet were strong enough for it. I have a friend who relearned how to run, so that she could run 'barefoot', but I didn't think it would be good for the hilly Lewa course. Who knows? Even Finn went back to trainers during his time running in Iten. The book is entertaining and well written. Finn focuses on the running in Iten, but he also gives you glimpses into the simple lives of these amazing athletes. The book made me excited to run again, I wanted to get on my shoes and get outside. I love Kenya and enjoy running, so I may be biased, but I don't think you have to be fanatical about running to enjoy this book. With Olympic frenzy reaching a peak, it is a great time to read this book! This sounds like a really interesting & unique read. I'll definitely be looking out for it! Ah! I gotta read this! sierra, yes, I think you would really like it! It has to be something special for you to see them running through the streets of London. i agree Pet-would be great to see it! Ooh that sounds good! I've been reading 'What I Talk About When I Talk About Running'... and it totally makes me want to run more! Zoe-I've read that a couple of times, lov it,read it when I need motivation to get the trainers on!